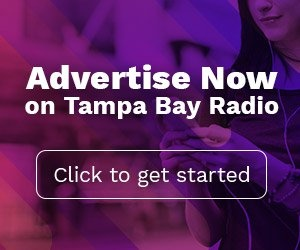 What is the Best Time to Advertise on Radio In Tampa Bay? You've done the research. You now know that by every measure, radio advertising is the most effective way for your Tampa Bay small business to market its goods and services. You have learned, for instance, 2,193,604 consumers regularly tune-in to their favorite Tampa radio stations. That's more than 90% of all adults. 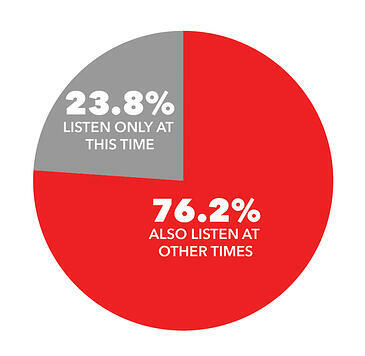 You've also learned that, on average, adults spend almost two hours per day listening to Tampa radio. If you dug deep enough, then you know radio advertising delivers, on average, a $10 lift in sales for every $1 invested. This is a remarkable ROI for any Tampa Bay small business owner. What you may not have figured out, however, is what is the best time of day to advertise on Tampa radio? 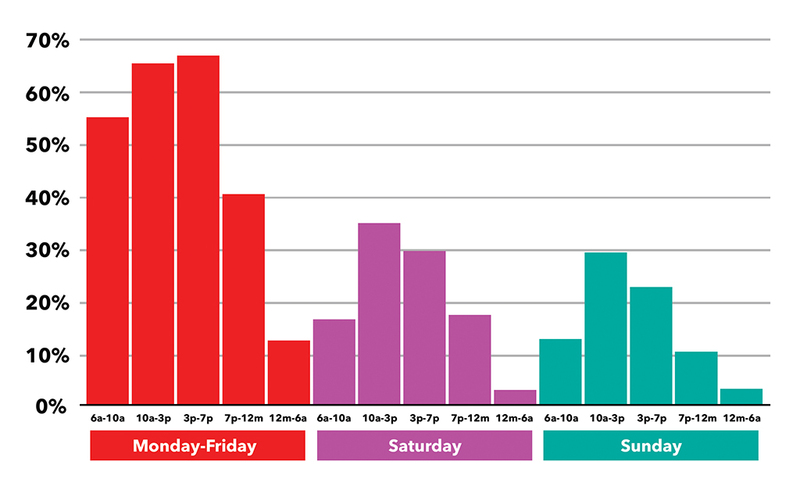 The chart below demonstrates that radio reaches a significant portion of Tampa Bay consumers during every part of the day including late-night, overnight, and on the weekends. It is also clear that most listening to Tampa radio occurs Monday through Friday between 6:00 am and 7:00 pm. This is often referred to as prime-time. As a consequence of supply-and-demand pricing, however, prime-time is also the most expensive time to advertise. For a Tampa Bay small business owner, then, advertising effectively only during prime-time could be cost prohibitive. But there is a way to reach the prime-time audience without paying a premium price. 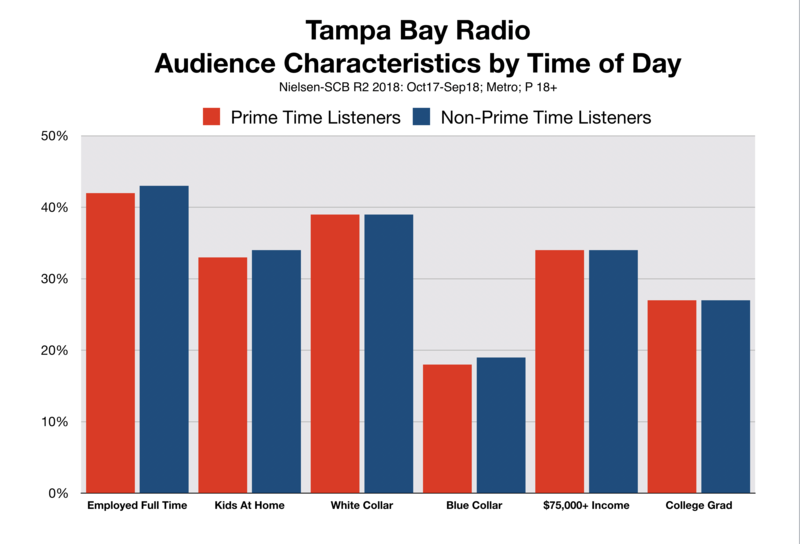 It turns out that almost 8-out-of-10 adults who listen to Tampa radio stations during prime-time also listen during other parts of the day as well. The good news for business owners is that the cost of advertising outside of prime-time is considerably less expensive. So, it is possible for the budget conscious Tampa Bay small business owner to effectively reap all of the benefits of radio advertising (the reach, the frequency, and the ROI) without breaking the bank. 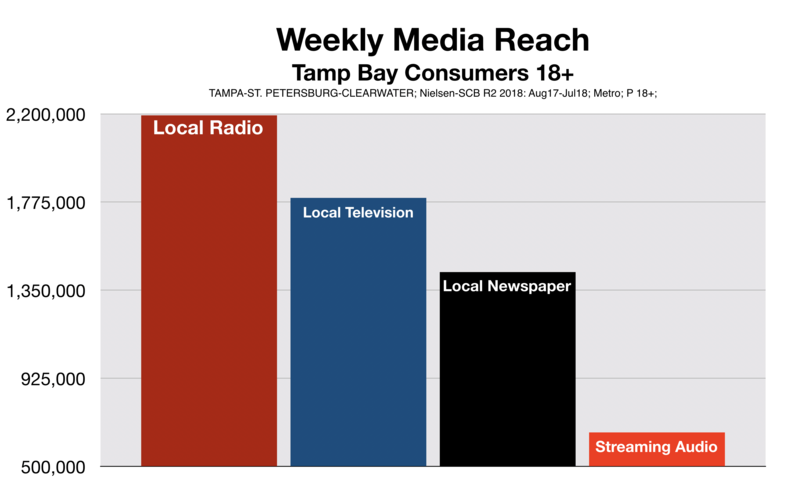 It is important to point out, though, that there is no difference in the quality of the consumers who listen to Tampa radio during prime-time vs. other times of the day. Therefore, regardless of the listeners a small business is targeting, that audience can be reached on the radio at any time. To answer the title question, then, "What is the best time of day to advertise on Tampa radio stations?" Every time of day is the best time.